Inflate the balloon and set it rounded side down on top of four egg carton cups. Rip the newspaper into small strips. Mix your paste in a bowl with a mouth wide enough to allow easy dipping or, if using glue, pour the blue into a disposable wide-mouthed bowl. Begin dipping the strips in the paste or glue and placing them around the egg carton cups and balloon, smoothing out wrinkles and forming the shape of a cauldron. Repeat this process of dipping, placing, and smoothing until you are satisfied with the appearance of your cauldron, or until the balloon starts to narrow into a point. 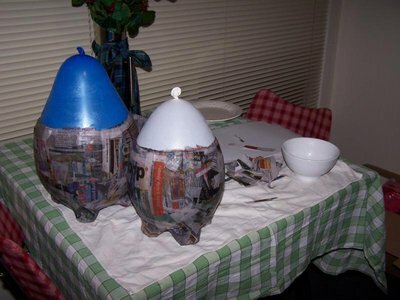 You will need several layers of pasted newspaper to get a good thickness. 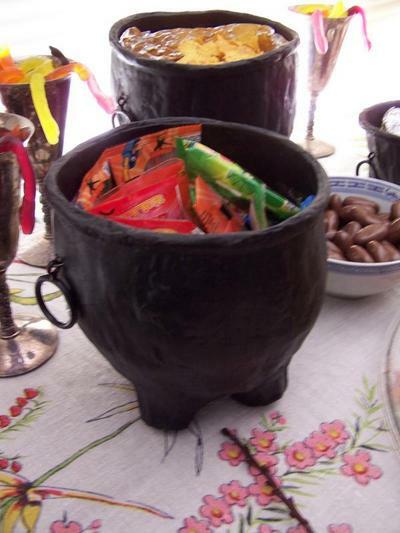 Allow the cauldron to dry completely, then remove the balloon and egg carton cups. Form a lip for your cauldron by rolling pasted newspaper around the edge of the cauldron, then let that dry completely. Insert the drapery rod rings into the sides with glue, and allow to dry completely. Paint the cauldron black inside and out. Allow to dry thoroughly, then fill with your favorite Hogsmeade treats!